Mondays: Christian Music Skate Night at the Skate Factory, 6:30PM - 9PM. Tuesdays: All You Can Eat Pizza Night at the Skate Factory, 6:30PM - 9PM. Wednesdays: Cheap Skate Night at the Skate Factory, 6:30PM - 9PM. Thursdays: Summer Fun Skate at the Skate Factory, 12PM – 5PM. Saturdays: Super Saturdays at the Skate Factory, 10AM – 11PM. Sundays: Family Fun Day at the Skate Factory, 1PM - 4PM. Nowhere to send your kids when school's out? (Canceled permanently) Free projects at all Lowes locations select Saturdays from 10AM - 11AM. Details will be posted on calendar below. Kids learn do it yourself skills, tool safety and more. Take home crafts, apron, pin and a certificate of achievement. Free workshop at all Home Depot locations first Saturdays, for kids 5 - 12 years old. Classes are from 9AM - 12PM. Kids learn do it yourself skills, tool safety and more. Take home crafts, apron, pin and a certificate of achievement. Click here and enter your selected store location. Military Discount for Military Families at Chuck E Cheese. THANKS FOR YOUR SERVICE! Chuck E Cheese's is proud to salute the men and women of our armed forces and their families. Recycle & Create Benches, Friends and Memories. 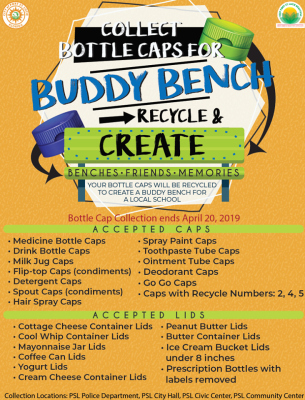 Your bottle caps will be recycled to create a buddy bench for a local school. 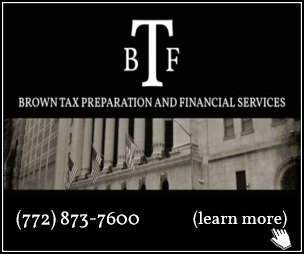 Collections end April 20, 2019. Accepted caps: Medicine bottle caps, drink bottle caps, milk jug caps, flip-top caps (condiments), detergent caps, spout caps (condiments), hair spray caps, spray paint caps, toothpaste tube caps, ointment tube caps, deodorant caps, go go caps, and caps with recycle numbers 2, 4 and 5. Accepted lids: Cottage cheese container lids, cool whip container lids, mayonnaise jar lids, coffee can lids, yogurt lids, cream cheese container lids, peanut butter lids, butter container lids, ice cream bucket lids under 8", prescription bottles with labels removed.
" The City of Port St Lucie is working with three local schools on a recycling project: Morningside Elementary, Oak Hammock K-8 and West Gate K-8. Each school needs to collect 200 pounds of caps to create one bench for their campus. Once collected, Keep Port St. Lucie Beautiful will send the caps to Green Tree Plastics, based in Evansville, IN, which has created a program designed to fabricate the benches to help educate students about recycling. Browse SupportStLucieCounty.com for more events. (January 2019 - JULY 2019 (1st Sunday in April)) Sponsored by Surfers for Autism and The Hope Center for Autism. Children with Autism and Sensory Processing Disorders can have fun and an interactive experience in a comfortable environment. $1 per person. Limited to 100 people (including children and adults). The ship cannons, fire station lights, and other details in the museum are modified to aid in creating this environment as well. For kids ages 2 to 5. Did you know that storytimes encourage literacy, imagination and socialization? Join us while we clap, dance, sing & listen to stories. Parents & caregivers, please plan to stay with children during the story session.